Growing potatoes organically is a challenge because late blight will destroy the plant and negatively affect the quality of the potato. Conventional growers use fungicides to control blight. Our question: is it possible to select or breed potatoes that are resistant to this disease? Here is part of a discussion Raymond Loo, an organic farmer in PEI who’s family selected two blight resistant potatoes in the 1990s, had with David and Jen Greenberg. 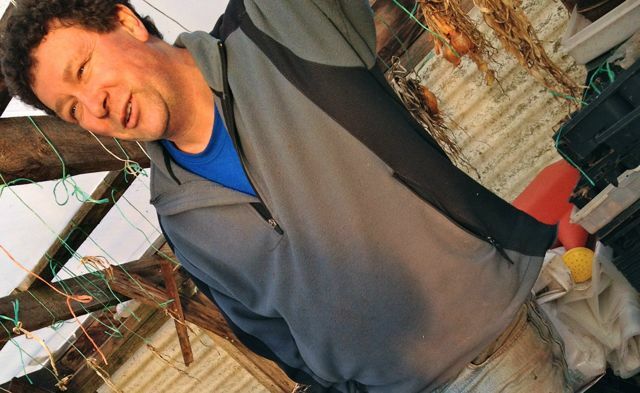 Both Raymond and the Greenbergs have been influenced in their thinking by Raoul Robinson, who was able to breed a disease resistant potato in Kenya. Raoul wrote a book, available for free on-line, called Return to Resistance. 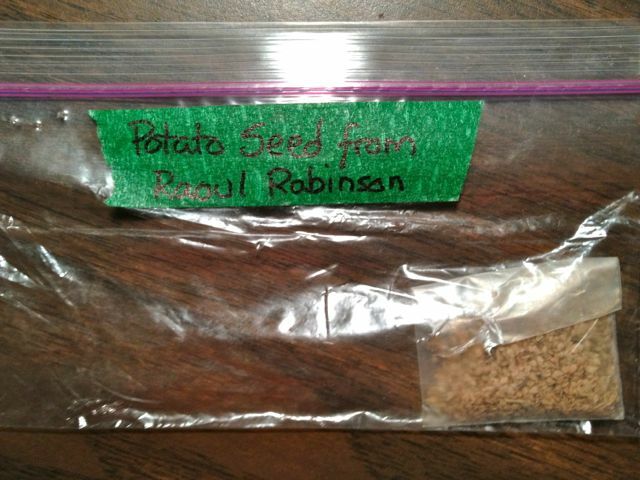 Raoul sent us a bag of true potato seed, which we grew out in 2012. We also got a few tubers to try from Raymond. This was the start of our potato selection program. It continued in 2013, and we plan to select again in 2014. Raymond: Potatoes are really well protected against blight themselves for the first while, and then as they mature they start losing their resistance. If you challenge [spray blight on] your potatoes really early in their life cycle, right after they emerge from the soil, you’re probably not going to see that big of a response. Wait until they get established. By this time they have a little bit of potato growing down in the soil. If at that point the plants start to succumb, and you see differences, you can pick out the ones that lasted the longest, and grow another generation from the tubers they produced. David: The blight starts about mid-August? Raymond: Yes, by mid-august it’s usually bad in PEI, for the last few years. Now last summer you could not have designed a worse blight year if you tried. Raymond recommended that we should aim for a short-season variety to reduce losses from late blight. He also thinks short season selections are useful in a world with a less predictable climate. Raymond: The later season varieties generally have more disease resistance in them, because that’s how come they last and survive longer; that’s what Raoul Robinson was saying. The long season varieties have more resistance in general. But not always. Russet Burbank is not very resistant and it’s a really late variety, and Shepody is a really late variety and it’s not resistant at all, so it’s not always that way. Fabula is a long season potato, but it has good resistance. And Satina is another relatively long season variety. It’s not really long — probably 100 to 120 day variety — but it starts to produce potatoes after about 65 days. You can start killing some at any point you have to and you still have some potatoes. But as far as stressing them goes, I would probably not worry about putting extra stress on them by spraying them with inoculant or anything like that. Especially when you only have 450 potatoes to work with, you might just wipe them all out! Raymond: Varieties that he’s selected? David: He did a 20-way cross. Raymond: Ok, a 20-way cross. So he’s been crossing them for a while. There should be a bunch of resistance in them that’s for sure. Do you have much more seed than what you planted? David: He gave me probably an ounce and a half? A packet of seeds. Raymond: That’s an awful pile of seeds in there. They’ll keep for a long time. I don’t know how old his seed is, but we had seed that was 10 years old and still fine. David: It seems that producing 100,000 seedlings is the beginning. 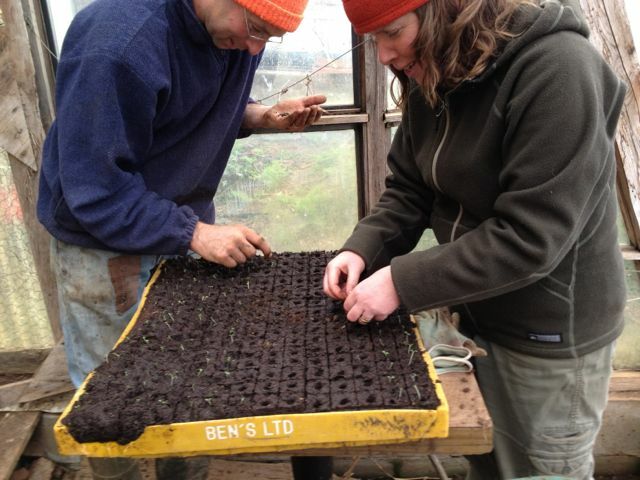 David Greenberg and Kate Babcock planting out potato seedlings into soil blocks, April 23 2012. 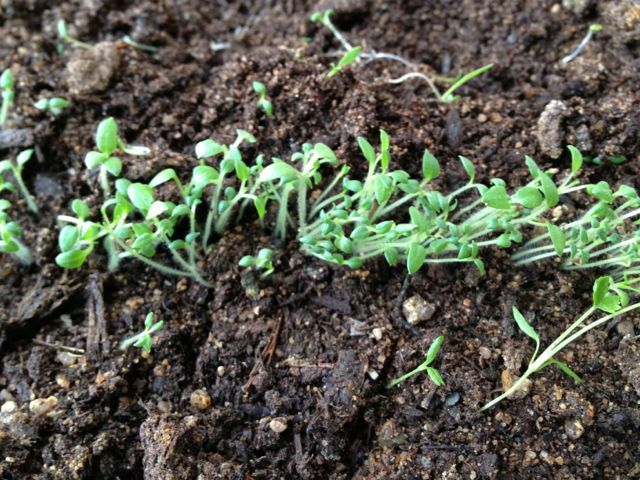 David: Start the seedlings. You grow them out. Most of them will die, and then you have the mini-tubers. You store the mini-tubers over the winter and plant them back. David: Can we do that first screening at one farm? Raymond: I think so. I think that’s the way to try and do it. David: Let’s say we have a three-acre field. We do; we have a three and a half acre field. It’s far away. It’s not really set up to do it, but we could donate that to the cause. And we’re an hour out of Halifax, so we could get graduate students and volunteers and people in our network to transplant them out even by hand. We could probably get 50 people to show up for a day. Raymond: Yeah, and that would do it. David: And everyone does 2000 seedlings in a day or two, over a weekend. We could get an awful lot done. Or we could get a transplanter going. Could we grow them on 36” centers with, 5 or 6” between each plant? Raymond: That would be close enough. That’s what I did. I went about 6” apart when I was doing ’em, because you only have to identify the potato. As long as you can tell which plant the potatoes came from. That’s all you need to do. David: That’s what we need. Then let’s say we save 5% of that harvest, so we have 5,000 mini-tubers to plant out the next year. Raymond: Uh huh. I’d be doubtful if you’d end up even with 5%. More than 1% but less than 5%. David: At that point, do you scatter those first-generation tubers around to other farms, or do you continue on the first farm? When do we distribute the material to other farmers? Raymond: If you can spread them around, I’d say the second generation would be the best point. Because really all you’re doing is keeping one tuber, probably – one or two tubers from the first generation. At least that’s the way I do it. I don’t know. It works, but maybe other people have better suggestions. I would sooner take 100 tubers and plant them. I can do that, I can do that myself. I can make sure I can have enough time to do that. What I would like to do would be to come over [to your location] at least one weekend throughout the summer and see what’s going on and probably another weekend in the fall and see how things are going. We’re not that far away. And help on the day I’m there. We could make it work. David: To do 100,000 seedlings, we’d need labour and materials. David: We’d probably need a transplanter. We don’t have a transplanter right now, but for 100,000 seedlings, we either need a huge group of people or a transplanter. Raymond: Yes! And then you’d have to figure which block size, when you start them. Our transplanter wouldn’t work for them; it would break the stems. The way ours works, you lay it down and it catches the leaves, the stem, and it takes it down. The plug of soil is hanging down. And it comes down like this into the ground with two packing wheels back behind. You’d need to have one of them ones where you actually set the plug in. David: An old style? Like an old New Holland style? Raymond: Yeah. Maybe something like that. I just know this one won’t work for potatoes, because the stems would break, and you’d end up with all kinds of problems. 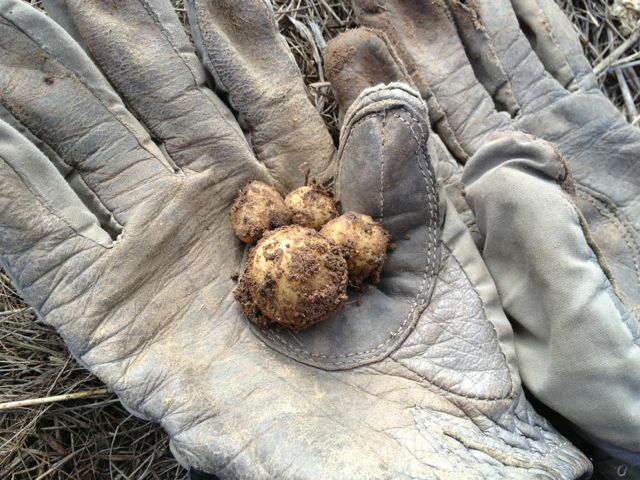 This entry was posted in farm mentors, potatoes, seed saving and tagged farmer mentor, potato selection, Raymond Loo. Bookmark the permalink. Sounds great,wonder if you have read that book about trophobiosis by Francois chaboussou? I will definitely check it out. What is the title?